55-gallon drums are a versatile and convenient storage method used in many different industries. They store everything from lubricating oils to diesel and hazardous chemicals. While popular and easy-to-use, they also pose some risks. Safe storage and handling of 55-gallon chemical drums is essential for preventing environmental incidents, fires or injuries. Ideally, always store drums of chemicals indoors. Outdoor drum storage poses certain risks, but safe practices and equipment go a long way to keeping the workplace safe. It sounds crazy, but 55-gallon drums breathe. The temperature changes in a normal 24-hour cycle are enough to raise and lower the pressure inside the drum. At the hottest part of the day, vapors push out of the bung; in the coolest parts of the night, air draws in. If stored vertically, rain water collects on the top of the drum’s surface. When the drum breathes, water draws into it and contaminates the contents. This can occur even with unopened drums. To prevent this, avoid storing drums on end with bungs on top. Store chemical drums on their side with bungs horizontal to each other. Store drums with side bungs on end or on its side, bung down. If the bung is submerged internally by its own contents, the drum is unable to breathe in moisture. If it is not possible to store chemical drums horizontally, place a block under one side of the drum with the bung parallel to the block. This creates a slope on the top surface so that water runs off of it, rather than collecting. Make sure the bung is not at the lowest point of the top surface. Staging areas continuously receive new chemical drums of product to replenish used stocks. It is important to prevent drums from excessive weathering, which could lead to corrosion and failure. The best way to do this is by making sure that the oldest drums get used first. This is the first in, first out (FIFO) principle. Outdoor drum storage is vulnerable to extreme weather events. Drums exposed to the elements could wash away and strike against obstacles. Puncturing a 55-gallon drum could cause a spill and an associated environmental incident. Locate outdoor storage areas above the high-flood mark to prevent chemical drums from washing away. Inspect outdoor drum storage areas for leaks and spills before they cause an environmental incident. Bulging drums are an indication of pressure buildup. Remove these drums for inspection and disposal if necessary. Signs of corrosion or evidence of leaks and spills should trigger follow-up investigation and action. A leaking drum in an outdoor storage area is a high priority concern. Outdoor spills may contaminate soil and pollute ground water. It could also migrate to nearby flowing water. Place a leaking drum in a drum collection center. These secondary containment vessels have the capacity to capture the entire contents of a 55-gallon drum, which can then be safely disposed. Spill containment pallets and accumulation centers are another form of secondary containment. They feature built-in sumps to contain the entire contents of the largest individual drum stored. 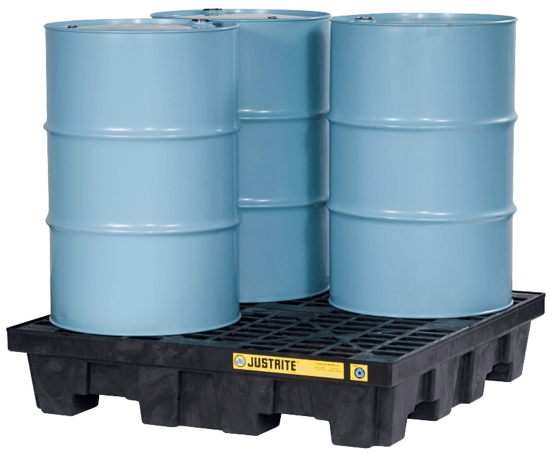 Support pillars enable spill pallets to carry fully loaded drums. But, they are also removable for cleaning in the case of a spill. RELATED TechTALK: How Does SPCC Apply to Justrite Products? Weather-resistant shelters or drum sheds have leakproof sumps and roll top doors. Drums are completely protected from adverse weather conditions inside a DrumShed™. Sufficient headroom allows adding funnels or pumps to drums without removing them from the shelter. Enclosed shelters are also lockable. This security provides a level of access control to hazardous chemicals. It is a mistake to think all safety risks are over once a drum is empty. Residual chemicals and vapors remain in the drum. Label empty drums with the product they contained and the date emptied. This informs workers about potential hazards when handling empty drums. As referenced above, used chemical drums still pose a risk. If an empty drum contained flammable material, it remains a fire and explosion risk. The best way to manage this risk is to remove it from site completely. Don’t allow used drums to collect on site. Dispose of drums using an approved and safe process. Flammable chemicals and sparks don’t mix. It only takes an instant for a stray sark to ignite flammable vapors. Keep welding and other hot work activities away from outdoor drum storage areas. If this is impossible, implement procedures for safe practices. Make the work area safe, before work begins. Bungs provide a seal between the contents of a drum and the surrounding environment. They ensure hazardous and flammable vapors stay inside the drum, protecting workers from health risks. Bungs also keep sparks out of drums. This protects the contents from ignition sources and the potential risks of fire and explosion. Empty chemical drums still contain enough vapors to ignite - so keep bungs in place at all times. 55-gallon drums are very heavy and awkward to maneuver. It is easy to lose control when rolling a drum, causing the drum to fall and possible injury. 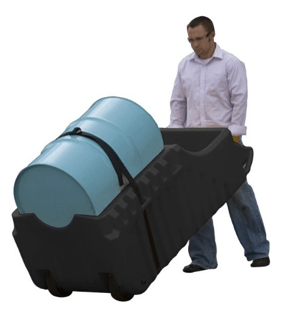 Spill containment caddies with built-in sumps are suitable for moving chemical drums. Their ergonomic design limits the risk of occupational injury. There may be occasions when you need to store drums outside temporarily or in a different area than normal. 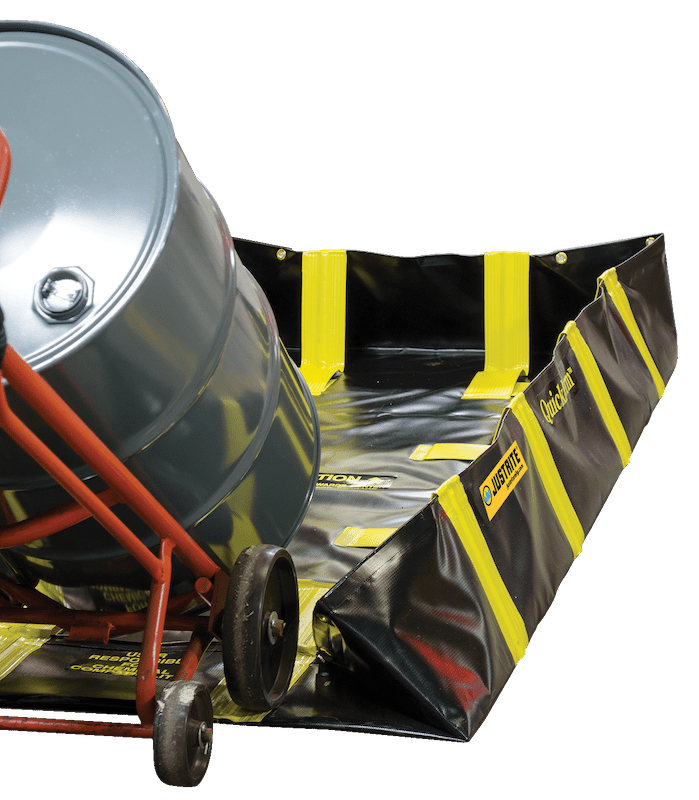 Use collapsible, easy-to-setup spill containment berms to ensure you meet SPCC regulations. If frequent drive-throughs are required, make sure the berm material can resist punctures and abrasions. It must also withstand long-term UV exposure. Always assume the worst. Risk assessments and emergency response planning could make the difference between life and death. Every employee should know what to do in the case of an emergency. First priority is to ensure the safety of fellow workers. Document emergency plans and make them available to all workers on the site. 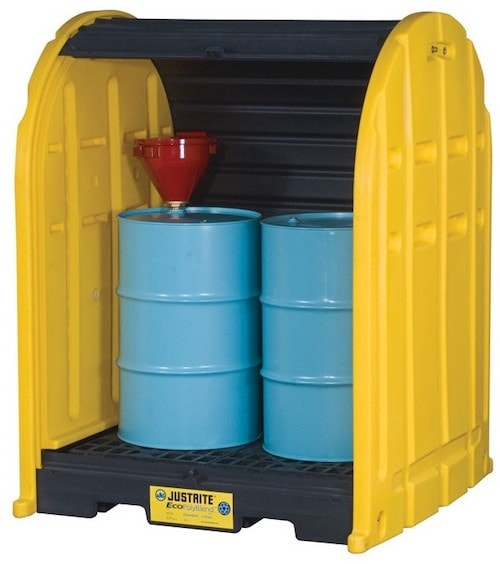 Justrite supplies multiple products for safe chemical drum handling and storage for outdoor use. Our spill pallets, drum caddies and drum collection center meet and exceed regulatory requirements. 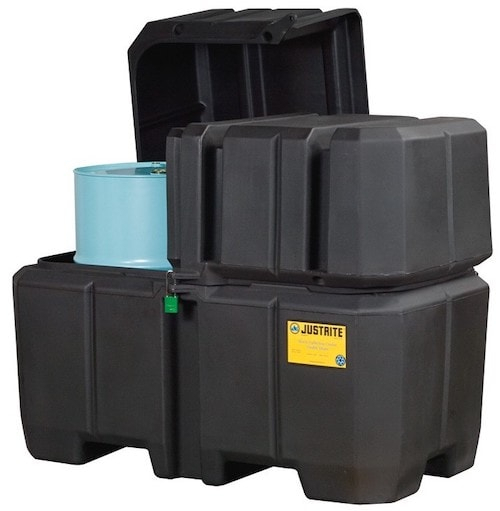 Browse our 55-gallon drum storage solutions here or contact Justrite for expert advice about your application.